Monday: Work. I’ve just had a look at the Google Analytics statistics for yesterday. I normally get about 150 to 200 visits a day. Yesterday it was 3,415. Which is pretty amazing. The bike wants sorting for tomorrows time trial this evening. Work went badly at the end of the shift and I ended up stopping an extra hour to sort it out on Bank Holiday of all times. Put some air in the tubular tyres for tommorrows time trial as I start at number 7. I’ll try and get around to all your comments as soon as I can. I’m a bit rusty for the time trial but I’ve give it a go as things can only get better. Back up to speed with the comment replies I think, all are welcome. There are a lot of comments coming through that mention inspiration but I didn’t see it that way, I was just doing something to help myself. I’ve been running the site for a few years now and Janes article has unleashed massive interest. I still remember the struggle of those early rides as the extra weight absolutely kills you on hills. I’ll endeavor to update the pages across the top and keep it relevant to those looking to make that change in their lives. The Weekending Posts that I write about now are what I do day to day now along with Big Ride writeups. For those starting out on a new plan the dieting industry needs a before picture which in my case was pretty hard to come by. For all those following Weightwatchers and Slimming World plans and others the main problem is that they are an industry and don’t teach you the essential exercise component of weightloss. Don’t be afraid to post a comment, I don’t bite I’m trying to help. Tuesday: Work, followed by time trial. Came home through Liverpool as I didn’t want the congestion of the Runcorn bridge. This is the first event of the Birkenhead Northend club time trial series. It’s also my first outing in the new club kit. Tempo has just put a picture of me up on Facebook which shows the colour clashes with my usual Discovery channel kit. They call time trials the race of truth as it is just you against the clock. That may be true but there is a lot more to it when you are up against your peers. You set off at minute intervals on a fixed course timed to the second. Tonight’s was the Brimstage 7 which starts on the doorstep. Starting at Heswall Hills it’s half a mile up a rise to Gayton Roundabout. This is hard to judge as going all out tends to leave you in deficit on the Chester High Road (A540) which is where you should be fast. Feel free to look at all the data as I was maxxed out for a lot it, every time I looked down it was looking at 177 BPM. There was traffic at Gayton roundabout but it was Ok if a little tight. Then it started to shower, not much of a problem until the turn for Thornton Hough. Slackened off for the turn as it may have been slippey and managed to miss one pothole by the Grange only to hit another. All this time I can make out my minute man in the distance. Wasn’t too pleased with my speed over the crest by the 7 Stars as it dropped to a little over 15mph. Which is much the same as last year. Next obstacle is the roundabout on the Clatterbridge- Willaston road. Two cars pass ok but a third can’t wait a couple of seconds and chops me up then stops as a car may have been doing a full circuit but didn’t. I was miffed. Next up was the Drayton Motor roundabout, this went Ok and I was still gaining on my minute man Brother James. I finally drew alongside and passed him at the roundabout as cars allowed a bit of a draft. The time 18.33 which I’m pleased with(it could have been a lot worse). Average 23.2 mph. Had a pint in the rugby club with Liverpool-Chelsea match on the screen and rode home. Going to be a nightmare tommorow, best apply myself to the job. The Liverpool supporters taking it quite well taking heart in putting 4 past Chelsea. Wednesday: Work, last day. MOT time for the Scenic means I’ll be under it tomorrow by the sound of it. Thursday: First day off, the Scenic got a new exhaust. Had a look at the handbrake and took it for an MOT which it passed. Called in at Europa pools and booked a spinning class as now you get 2 hours parking free if you have an Invigorate card, finally they are using some common sense. Spoke to Louise after a hot class as she has just restarted after getting her leg broke by a Liverpool Echo van. Mentioned that Barbara had finally found the site after me writing about her classes for over two years. I didn’t want a war between the instructors over whose was the hardest class. Tonight was a 707 calorie class by the way. Home via Lidl which has cycle shoes and helmets along with track pumps on offer. If your starting out after seeing the BBC story this is where I started. It’s great value and you need to start somewhere. I’ve bought the shoes before. They take an SPD cleat and you can walk in them. Friday:Rain stopped play in the morning so I read Cycling Plus. There is some good stuff in it this month. Including a ride based on the Horseshoe Pass. Now it’s a tough climb but nothing like the Old Horseshoe Pass. It’s too narrow to send the Milk race up or any race but gives you a sense of achievement when you’ve done it. If your looking to start on the road I’d recommend Cycling Plus as it’s the only publication based on road riding. The Mountain Bike magazines don’t feature any road content as they are wholly off road. 107 Dining Room for lunch, should have stuck with the one course for a fiver but thought I’d try the two for £8 as there was more selection. Couldn’t fault it but it’s going to take some burning off. Had a look at the GarminConnect link for Tuesday as I’m now third in the Northend time trial handicap league. I’m only 2 BPM off my max for this year which is 184 BPM, no wonder it felt hard. 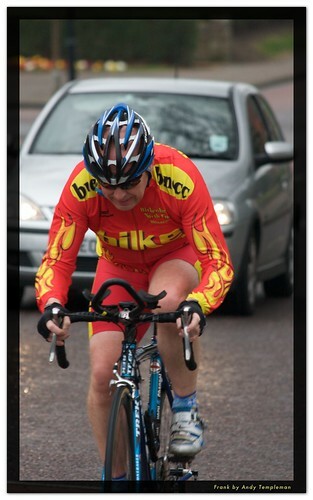 Tempo sent me the pics he took at Gayton roundabout and I’ve got my raceface on them all. Margaret’s spinning class at West Kirby, thought I had scewed up the HRM settings as all the instructors want to know how many calories are burnt in a class. After looking at at wrong page for 45 odd minutes it was 637 calories which is about right. Sort the bikes out when I got home, a light dinner and watched a DVD. Blog to keep up to date. I’ll post more on the ride write up. Sunday: Another nice day for a ride. Locked out of my GarminConnect account which is not a good start. Not planned to do a ride today as it is a Jack day. Took a trip out to Carrog to see the steam engines. Your site is a fabulous inspiration, I have it in my favourites now to refer to often. You are right about Slimming World and WW, they do not make enough of how much exercise you need to do on top of healthy eating. I am 14lb down since starting with SW 3 weeks ago, and exercise hasn’t been mentioned yet! But thanks to the BBC article and finding your blog, I am going to dig out my dusty old bike and get on it! Any recommendations for a basic “mileometer” for a pretty basic mountain bike? Thanks so much for your time and effort with your truly inspirational blog. Thanks Rachael but do take it easy at the start. My bikes taken me places I’d never had imagined going to on a bicycle. Regarding the mileometer look for one that has average speed. If your average is 10 mph it’s easy to work out that it’s going to take 2 hours to do a 20 mile ride. If it has suspension on the front you may need a wireless system which are dearer. Ask your local bike shop if you have one. Silly me you live in London. The only other thing that struck me the other day as everyone was out on budget bikes was the puncture fixing situation. The bike needs quick release wheels. The cheapest bikes don’t have them. Even if you phone for someone to pick you up, you will still need tools to take the wheel out to get it in the car. Hi Frank, came across your site while browsing, Bikeradar.com., I think. Getting to the point, I’ve been cycling for 4 years now, started at 17st. 7lbs., only managed to get to 16st. I’m 5′ 7″, quite broad, and with a BMI of 31 ? I cycle 200 miles a week every week, no matter what the weather, and eat lots, because I’m hungry. I feel great, but suffer on the hills, no doubt because I’m transporting so much weight. Should I diet, or just be thankful for how great I feel. Welshcyclist it sounds like you’ve plateaued. Diet maybe too drastic a word but you should take a look at what your eating and the portion sizes. I’m still following the BHF plan and don’t feel hungry. At the start I’d plateaued as I though I was doing enough to eat mars bars, cocacola and icecream while out on a short ride. I think the general concensus is rides of up to 90 minutes drink water, over that an energy drink. Your getting the miles in so it’s not down to lack of exercise. I still suffer on hills but they are a lot bigger and steeper. When I was out on my own I’d actively avoid them and just rode on the flat. That leads on to the gearing issue and why I’ll always ride a triple. Any reduction is going to make you ride better on hills. Hi Frank, great performance the other night. Tips for Welshcyclist,don’t eat after 7pm, what meals you do have make the portions smaller, use small plates to make the food look like more than it is and drink lots of water, cut out the booze (if you drink) they are dead calories. Thanks to Frank’s advice I lost over four stone in 12 months. Hi Frank, I thought I was the only one that had caught this cycling madness! A year ago I was 20 stone’s, I hated the idea of exercise and loved all of the wrong food. Some friend’s suggested cycling John’O Groats to Land’s End. I contemplated the idea over a weekend and made the right decision, one that has changed my life so far. Now 366 days later I have cycled over 6250 miles (over 550 miles this month already), I have lost over 5 stones, I no longer get out of breath from normal life, I no longer have dandruff or any other skin complaints and best of all my attitude’s to people and the environment has changed for the better, I love the cycling our countryside and wildlife is amazing! It is very satisfying completing a 100 mile ride, I always end up with a smile on my face and the knowledge that you can eat whatever you want and you are still in calorie deficit. I personally wish I had rediscovered cycling years ago! John, we have a hell of a lot in common. I’ve never mentioned the skin complaints before. I’m in the same boat wishing I’d done it years ago. Good luck with the trip, it’s on the list but not near the top yet. I’ve looked at your excelent blog and will add a link to it. The number of cycling weightloss blogs mean they are going to get a section of their own. Hi Frank, what you’ve done is an inspiration to many you’re too modest!! The comment re. Slimming World and Weight Watchers I disagree with a little bit as you might expect. Slimming World does encourage members to do BodyMagic which is basically advocating taking up moderate exercise and then building on it. I did the same as yourself and started off with cycling as my main exercise component before doing my wrists in after hitting a pothole and so took up running which I’m now hooked on. However, I did find that Slimming World’s eating plan helped me no end in making the exercise easier and that exercise and the eating plan worked brilliantly together. Although I’ve put some weight back on I’ve maintained 3 stones off my start weight since Feb 07. Wish I was doing as well as yourself though! Keep up the good work, the site’s a great read! finding your website quite addictive, well done on everything you have done so far. I lived on the Wirral for may years so your recent time trial journey was intersesting in that you went past my old front door ! I have probablt been as high as 17stone in my time, currently hovering at 16 but enjoying my cycling. Reading your posts is an encouragement to make the next step change and make those hills more enjoyable. Noticed CTC has now mentioned you too – hope the encouragement gives you the right impetus ! Hi Paul, I’ve noticed you were doing a lot more running, I’m wary of it as I had knee problems carrying all that extra weight for 10 years. I’m 5 kg up on my best but still under the weight limit of a Colnago Extreme C, 88kg. Val had me on the red and green days for a time but didn’t go to the classes and never did any exercise to go with it. Changeing to an easier job meant the pounds piled on. I stopped putting the weight on the blog after a few remarks that it was obsessive but still weigh myself in the morning. I’ve data going back to 2006 now. Hi, my husband just pointed out your site in his own blog and I was bemused to read some of it, John’s reasons for riding are slightly different, he has an end goal in mind but does it for similar reasons, weight loss and a healthier life style, he started off with waist size of 44-46 but is now down to 36 and kept a log of all his hard work on his blog, I am really proud of him and also admire your continuing hard work. Thanks Bryan, at some stage I’m going to have to go back to my CTC roots. They differ from road clubs in that the best route is always the best rather than the quickest. The other thing is it’s about the ride full stop. 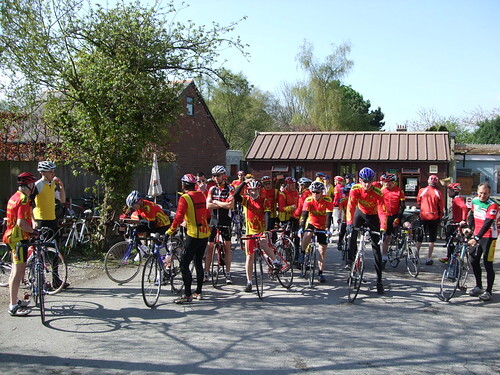 It’s not a training ride as it’s a social event. I’ve had some great rides with the CTC and expect to have a lot more with them. Sasha, he’s done really well in just a year. I know he has a goal and he looks like getting it but what next?. Gogle is probably beyond me at the moment, I want to see the Tour this year and do a classic climb and I should be happy. It would be such a waste to go back to the way I was, if not eventually fatal. Next Next post: Northend Ride to The Ponderosa Cafe.